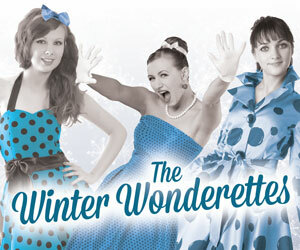 The Winter Wonderettes at Arts West opens November 23rd! Looking for something magical to do in Seattle this Holiday Season? The Winter Wonderettes will be performing at Arts West from November 23rd through December 30th! It’s Christmas, 1968–get ready for songs, songs, and more songs! Take a nostalgic trip through the musical style of the late 50s and early 60s when the Marvelous Wonderettes–Betty Jean, Cindy Lou, Missy and Suzy–are asked to entertain at the Holiday Party for Harper’s Hardware. While the girls decorate the hardware store, turning it into a winter wonderland, Mr. Harper, dressed as Santa Claus, goes missing, and the girls must use their singing talents to save the day. And the much-anticipated holiday bonus envelopes may just bring surprises. The marvelous cast includes Amanda Carpp, Roxanne De Vito, Kimberly McFerron and Victoria Spero. Purchase tickets here. Or call the box office at 206.938.0339 for tickets. Donate to Arts West in honor of someone special – makes a great gift!